“Afghan and U.S. officials have also disagreed on the issue of detention without trial. Washington wants the Afghan government to continue holding certain prisoners it views as dangerous, even if there is not enough evidence to try them. “In a phone call on Tuesday, Vice President Joseph R. Biden Jr. told the Iraqi prime minister, Nuri Kamal al-Maliki, that the United States believed that Mr. Daqduq should be held accountable for his actions and that Iraq should explore all legal options toward this end, an American official said. . . .
“But Mr. Maliki told Mr. Biden that Iraq had run out of legal options to hold Mr. Daqduq, who this year had been ordered released by an Iraqi court. . . . Iraqi officials have said that they thought delaying Mr. Daqduq’s release until after the American presidential election would mollify the Obama administration. American officials have repeatedly insisted that they did not want him released at all . . . . 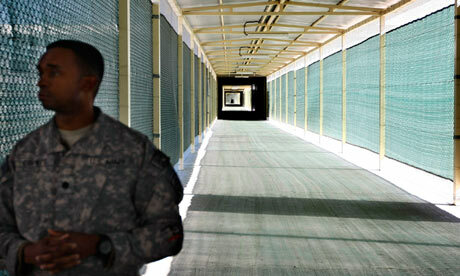 US efforts to persuade the Iraqi government to transfer him to US custody for “trial” in a US “military commission” – where he would likely be detained either at Guantanamo or a specially created military brig in South Carolina – were previously rejected by the Iraqis on the ground that they have sovereignty over acts committed in Iraq and would honor the decisions of their courts. US claims that the release of Daqduq is the by-product of Iraqi closeness to the Iranians (rather than respect for due process) may well be accurate, but that does not make ongoing imprisonment in defiance of a court finding any more justified. As is true in Afghanistan, this battle over basic due process rights has a long history over the course of the US occupation of Iraq. In 2008, the US refused to release imprisoned Reuters photojournalist Ibrahim Jassam despite a ruling from an Iraqi court many months earlier that there was no evidence to justify his detention and that his release was therefore compelled. For two years, the US imprisoned AP journalist Bilal Hussein, an Iraqi citizen, without charges of any kind until a four-judge Iraqi judicial panel found his detention in violation of the law and ordered him immediately released. It is ironic indeed that the US is demanding that the practice of due-process-free indefinite detention be continued in Afghanistan and Iraq, two countries it invaded and then occupied while claiming it wanted to bring freedom and democracy there. But on one level, this is the only outcome that makes sense, as a denial of basic due process is now a core, defining US policy in general. The Obama administration not only continues to imprison people without charges of any kind, but intended from the start to do so even if their plan to relocate Guantanamo onto US soil had not been thwarted by Congress. At the end of 2011, President Obama signed into law the National Defense Authorization Act which codifies the power of indefinite detention even for US citizens, and – after an Obama-appointed federal judge struck it down as unconstitutional – continues vigorously to fight for that law. And, of course, the power to assassinate even its own citizens without a whiff of due process or transparency – the policy that so upset Afghan officials when it was proposed for their country – is a crowning achievement of the Obama legacy. It’s hardly unusual, of course, for the US government self-righteously to impose principles on the world which it so flamboyantly violates. Indeed, such behavior is so common as to barely be worth noting. Just this week, President Obama managed with a straight face to defend Israel’s attacks on Gaza with this decree: “there’s no country on Earth that would tolerate missiles raining down on its citizens from outside its borders.” As Liliana Segura, Jemima Khan and Reason’s Mike Riggs all quickly noted, this pronouncement came from the same man who has continuously rained down missiles on the citizens of Pakistan, Yemen, Somalia and other countries. Meanwhile, UN Ambassador Susan Rice took to Twitter last night to denounce changes to a draft UN resolution that condemns “extrajudicial killing” – even as her own nation and its closest Middle East ally continue as the global leaders of this practice. Still, there’s something particularly revealing about the US demanding that the governments of Afghanistan and Iraq abandon any commitment they are attempting to develop (albeit quite selectively) to basic due process rights and instead imprison anyone the US wants imprisoned – even in the absence of evidence of their guilt and even in the face of judicial findings that their detention is without evidence and unlawful. As it turns out after all, the US is indeed spreading its core values to those two nations, though those values have nothing to do with freedom and democracy except to the extent that they are the primary impediments to achieving it. A transcript has been posted of the keynote speech I gave on Saturday night – on civil liberties, the Constitution and Islamophobia – to CAIR’s annual event in the Bay Area. Those interested can find that here.